Use Element 3D... the Mograph way ! Element 3D is certainly one of the most popular and powerful 3D plugins for AfterEffects. But it can be sometimes a little bit tedious to dive into its deep features and 3D animation principles, especially for newbies. Creating common motion graphics like animated cloned cubes, 3D objects assembly animations or even 3D titles, could rapidly become time-consuming, while you can achieve such complex animations in just a few clicks within Cinema 4D with its awesome procedural animation module named MOGRAPH ! Please note that Element 3D is required to use this tool. Buy it in a bundle and save! 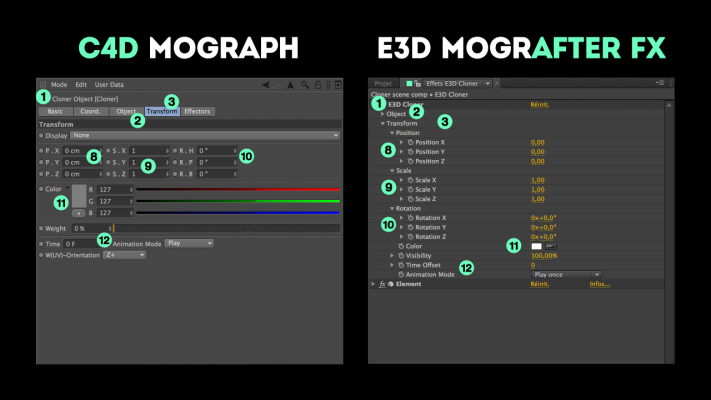 Introducing... E3D Mografter FX ! E3D Mografter FX toolset has been designed to dramatically boost your Element 3D animation workflow in After Effects. 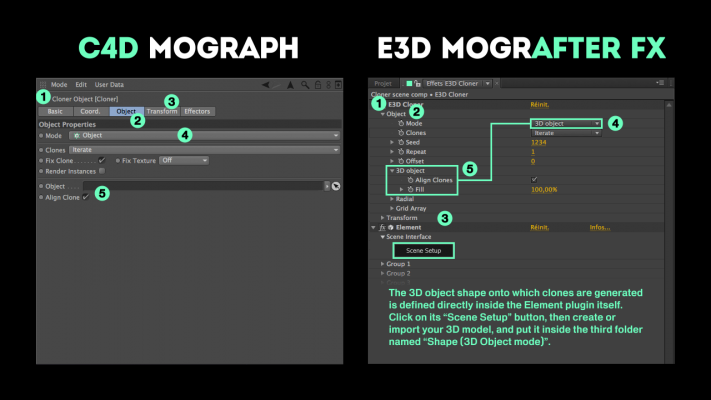 It kind of mimics the objects and their controls you can find inside C4D’s Mograph module, like the famous CLONER, FRACTURE, and MOTEXT generators, each compatible with a real powerful EFFECTOR layer. Just move the Effector layer in After Effects’ 3D space and tweak its various options to instantly animate your clones, models sub-parts or 3D text characters in a much more easy and intuitive way ! Replace the default objects with your own and you are ready to achieve appealing motion pieces in a matter of seconds ! The 6 different pre-built Element 3D scenes have been designed to help you create the most common motion graphics projects such as animated clones onto a custom 3D mesh, multi-objects exploding, dissolve or assembly effects, or animated 3D titles. Benefiting from a huge help documentation, since you can refer to a 50 pages user-guide, and the online help from Maxon’s Cinema 4D ! What it is NOT ? 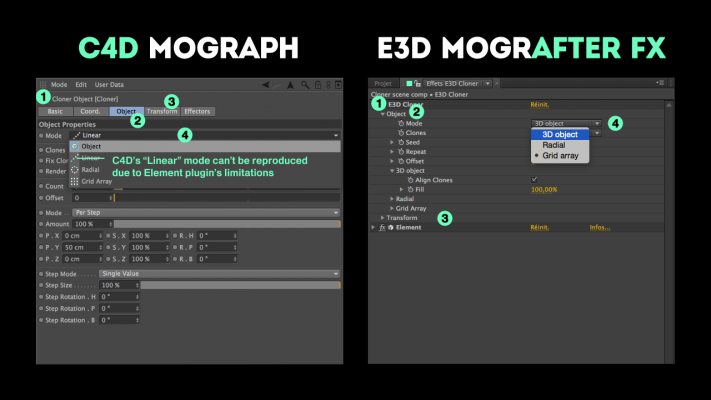 The E3D Mografter FX toolset is NOT a plugin and will never replace any real 3D application. It’s just a workflow helper that helps you create faster in Element. 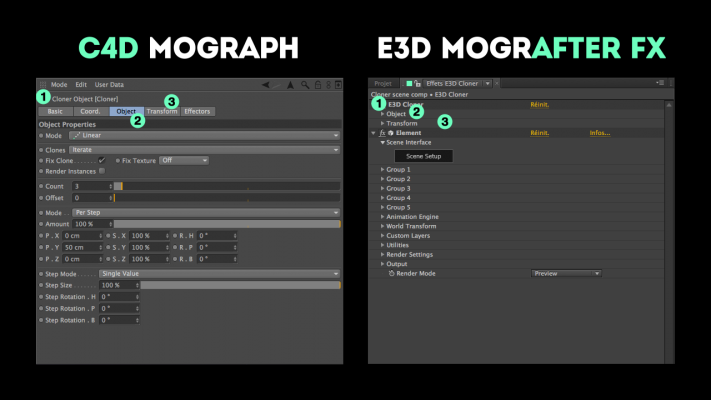 The E3D Mografter FX toolset CAN’T really do anything more than Element is already capable of with its own workflow; it is rather a matter of taste and habits ! Just run the "E3D Mografter FX - PE Installer.jsx" file (contained in the "CS6_installer" folder) from After Effects' File menu > Scripts > Run script file, and restart After Effects before using the toolset. Digit Fiddler is your complete solution for counting anything in After Effects using a single slider. TextBorder creates a perfectly sized and customisable border around your text that updates automatically.